Earlier this year, my daughter and I decided to take advantage of the promise of a few hours of unbroken summer sunshine, and headed for St Ives. 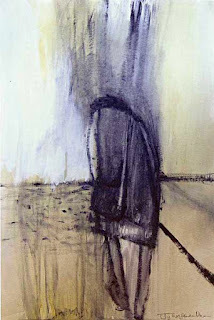 At the Millennium Gallery, we found to our delight that Joy’s latest exhibition, ‘The Still Point’ was under way. 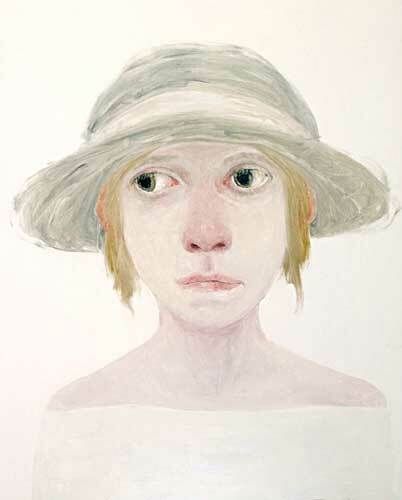 Up close, I was struck by the way her loosely applied brushstrokes exposed the fragility of figures she describes as ‘silent and sometimes barely separate from the space they inhabit’. 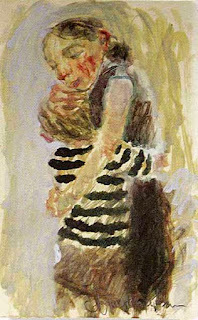 To appreciate the scope of her paintings in the quiet, contemplative gallery space was a memorable experience, and I came away resolved to begin my research. A selection of her early exhibition catalogues, held in the art library in Penzance, revealed that Joy Wolfenden Brown was born in Lincolnshire. She studied art initially in Lincoln, subsequently attending Leeds University, where she obtained a degree in Fine Art. After taking a postgraduate diploma in art therapy, she spent ten years working in the field of mental health. In 1998 she and her husband decided to move to north Cornwall to bring up their two children - a homecoming of sorts, as Joy’s mother and grandfather had grown up nearby, just across the border in Devon. I met up with her at home in Bude after her summer break, just as she was about to resume painting in her attic studio - a space which, she says ‘welcomes me back like a warm friend’. Joy explained that the desire to return to her passion for painting was awakened when her boys started at pre-school and she had a few hours to herself each day. An outpouring of creativity followed – one which was largely intuitive, though inevitably shaped by her professional life as an art therapist. 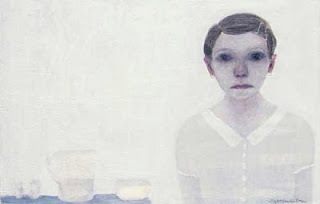 While her images are not drawn from life, and cannot be regarded as portraits, her figures emerge as unique individuals, many of them isolated and vulnerable. Sometimes the palette is muted; at other times the paint handling evokes the angst of Expressionism. The juxtaposition of the ethereal and the visceral is compelling. 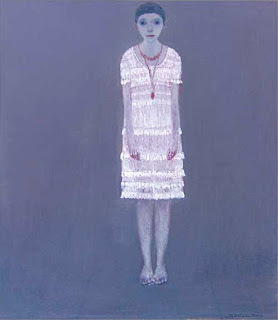 Anyone who has ever been at boarding school will recognise the young girl in Homesickness. The set of the mouth eloquently expresses the struggle to contain the emotions which threaten to overwhelm her - though whether she is intended to represent a young girl or a woman is unclear. Joy has been surprised when her figures have been identified in this way. She is reluctant to discuss or analyse her work since she has ‘come to understand the importance of painting as a container and conveyor of silence’. But she did suggest to me that the title Homesickness related to her own feelings of restlessness, dispelled by the process of painting in the ‘safe haven’ of her studio. Uncertain as to how they would be received, Joy took her early endeavours to local craft fairs. To her delight her artwork found ready buyers, also attracting interest in galleries in the nearby towns of Camelford and Padstow. 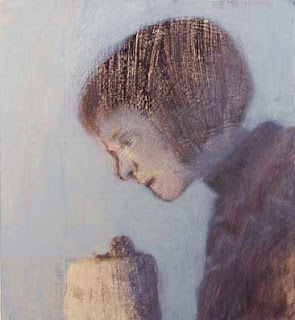 A turning point came in 2003 when she was awarded the Somerville Gallery painting prize (Exeter Phoenix), under the auspices of the South West Academy of Fine Arts. This accolade gave her the confidence to approach Joseph Clarke, director of Goldfish Gallery in Penzance. He responded by including her in a mixed show later that year, and holding solo shows for the next five years. 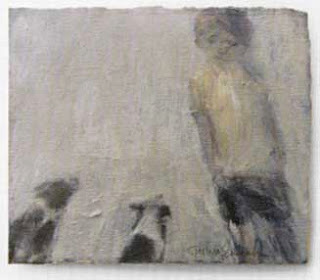 Clarke says of her work ‘For me, the power of her painting is to remind us of the child, with joy and vulnerability, who lurks within all of us.’ In 2007 the Beaux Arts Gallery in Bath also began to host regular exhibitions of her work. The pace and rhythm of Joy’s output is best concentrated on one show per year. So she is now represented at Clarke’s Millennium Gallery with an individual show every other year, and her next solo show is scheduled for November 2013 at Beaux Arts. Another solitary figure is represented in Tea. 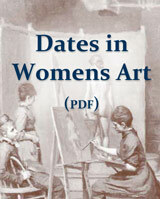 The title implies a social occasion, yet the subject of the image is located against a background starkly institutional. Her gaze is averted and the table is laid for one. I am tempted to speculate whether the pale grey brushstrokes behind, and to the side of her head, suggest the presence of a spectre, giving rise to her haunted expression. But imposing one’s own narrative onto these paintings misses the point. They touch a nerve, confronting us with the uncomfortable awareness that, on the deepest level, the vulnerability which we imagine uniquely ours is, in fact, common to all humanity. The bowed figure in Leaving You plods towards a flat, featureless horizon without a backward glance. As in Tea the undefined brushstrokes to her left hint at the existence of a companion, insubstantial as a ghost. At various stages in the painting process, Joy’s canvases can include additional figures, which are usually painted out before she considers the work complete. The incorporation of a second figure does not always rest comfortably with her, suggesting that she is irresistibly drawn to the representation of the solitary individual, as a painting such as The Lacemaker testifies. 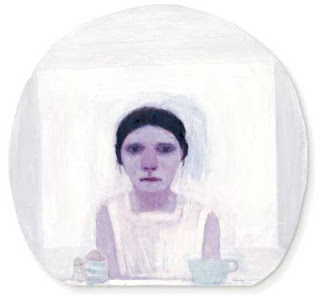 From 2006, Joy’s paintings began to reach a wider audience with exhibitions in London, including the London Art Fair. During that year, her work was acquired by the Anthony Pettullo Outsider and Self Taught Art Collection, in Milwaukee, USA. In 2007 she became the winner of the prestigious Sherborne Open Prize. Despite her growing reputation Joy, like all creative people, is susceptible to self-doubt, particularly after time spent away from her studio. Her early expectation that she would one day experience a ‘eureka’ moment has given way to the acceptance of an artistic process marked by ‘small epiphanies’. A prayer entitled ‘God of Snails and Tortoises’ was the catalyst for Joy’s recent show at Millennium. Its message is that we should slow down and contemplate each moment, rather than being caught up in the frenzy of life. Joy’s courage in doing this has engendered an awareness that her painting needs to take its own course. This has led to the creation of a remarkable body of work which , in her own words, ‘records the moments when truth breaks through’. At a ceremony in London yesterday, Joy Wolfenden Brown was awarded the coveted first prize in the 16th annual National Open Art Competition with The Lacemaker selected from a field of 2,100 submissions. 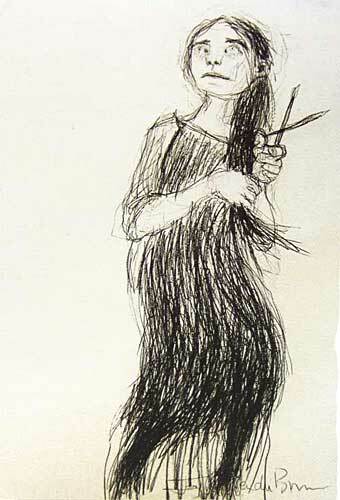 The artist, who was shortlisted in 2009, is delighted as she has a special fondness for this image. Timely recognition for a painter of extraordinary talent. Thanks to Joseph Clarke and the staff of Millennium Gallery, St Ives, for their assistance, and for permission to reproduce the images in this article. A lovely article and an insightful read. After winning the National Open Art Competition, I'm sure Joy will be under a bit of pressure from more people! This is a 'small revelation' for me as I have seen her work too at Stoneman's Gallery on Chapel Street, Penzance, and really liked it. Thanks for your perceptive and empathetic review of her working habits and the artistic output. Lovely! And many congratulations on her national prize.